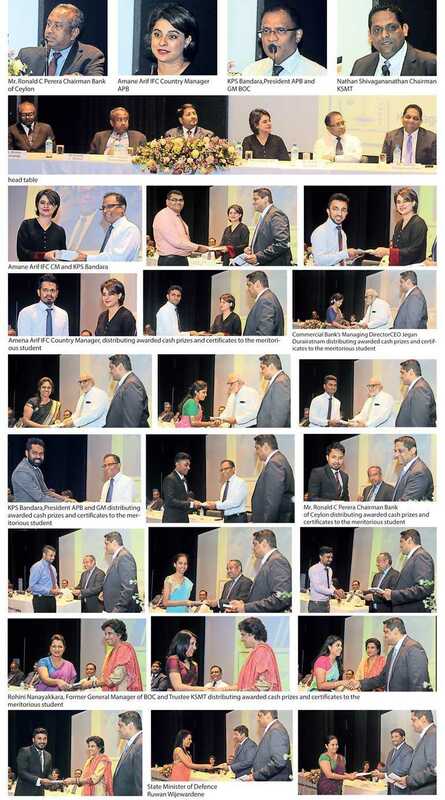 The 16th Annual K. Sivagananathan Memorial Trust (KSMT) Awards ceremony was held recently at the Bank of Ceylon Auditorium. This Annual Memorial Oration and Awards ceremony is conducted together with the Association of Professional Bankers of Sri Lanka (APB) in commemoration of the late K. Sivagananathan who was an innovative banker and contributed much to uplift and upgrade Sri Lanka’s premier state bank – the Bank of Ceylon. He also worked tirelessly with the APB and IBSL to improve the standard of education in the field of banking and finance in Sri Lanka to be on par with international standards. Chief Guest at the event IFC Country Manager for Sri Lanka and Maldives Amena Arif delivered the annual memorial oration and she put emphasis on women’s economy and gender equality. She said women and girls make up a little over half the world’s population, but their contribution to measured economic activity, growth, and well-being is far below its potential, resulting in significant socio-economic consequences. Globally, only half of women participate in the labour force, compared to three quarters of men. In developing countries, up to 95% of women’s employment is informal; in jobs that are unprotected by labour laws, or which do not benefit from social protection. Women and girls are also the face of poverty, the latest Progress of the World’s Women 2015-2016 by UN Women finds that women are more likely than men to live in the poorest households in 41 out of 75 countries. Financial services are a core enabler for consumption smoothing, risk mitigation, self-employment, SME growth, asset accumulation, and wealth creation. Lack of access to financial services reduces women’s ability to climb out of poverty; increases their risk of falling into poverty; contributes to women’s marginalisation to the informal sector; and reduces their ability to fully engage in measurable and productive economic activities. 42% of women and girls worldwide, approximately 1.1 billion, remain outside the formal financial system, according to the Global Findex database. Despite recent progress in financial inclusion rates in general, the gender gap has not narrowed: While account penetration increased by 13 percentage points among men and women between 2011 and 2014, the gender gap remains a steady 7 percentage points. Among adults living in the poorest 40% of households in developing economies, the gender gap is 11 percentage points. The gap varies significant by region and is highest in South Asia. Guest of Honour of the event Bank of Ceylon Chairman Ronald C. Perera put emphasis on digitalisation of banking services. He said digitalisation of banking services are very important to make discipline in the finance system of any country. KSMT Chairman and MAS Holdings Chief Growth Officer M. Nathan Sivaganathan briefed about the K. Sivagananathan Memorial Trust and said that it is a non-profit organisation predominantly dedicated to providing assistance to students pursuing higher studies in the field of banking and finance and encouraging them to excel in their examinations to achieve a higher standard to be in par with the developed countries, which was one of late K. Sivagananathan’s wishes. 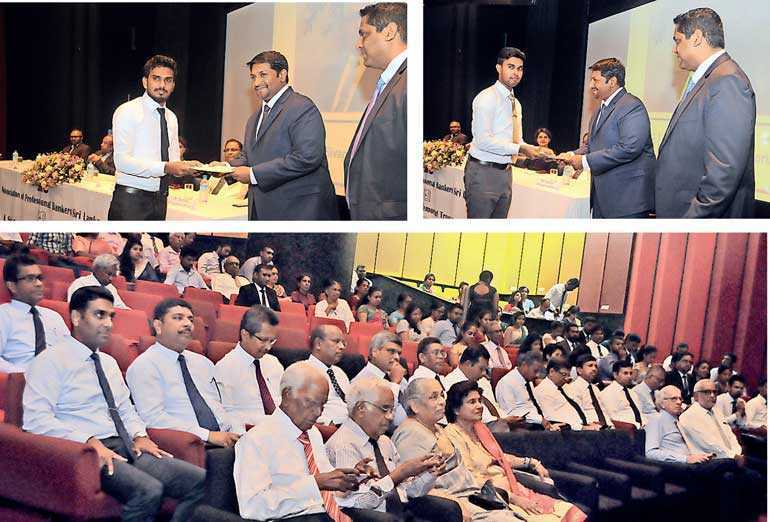 During the event a total of 40 students who obtained the highest marks in the Diploma in Applied Banking and Finance (DABF) in the March and September 2017 examinations conducted by the Institute of Bankers of Sri Lanka (IBSL) were awarded cash prizes and certificates which were distributed by the chief guest Amena Arif, distinguished guest of the evening State Minister for Defence Ruwan Wijewardene, Guest of Honour Bank of Ceylon Chairman Ronald C. Perera, BOC Former General Manager and KSMT Trustee Rohini Nanayakkara, APB President and Bank of Ceylon General Manager KPS Bandara and Commercial Bank Managing Director Jegan Durairatnam. The examinations conducted by the IBSL, affiliated to “IFS School of Finance”, UK, formerly known as the Chartered Institute of Bankers London, open to the bankers and public, tremendous enthusiasm has been shown not only by bankers but by those who aspire for a career in banking and finance. The event conducted jointly by APB and KSMT for the past 15 years has met the objectives of both institutions.